I have always liked QSC RMX series amplifiers for PA. Well defined and detailed sound and extremely well made. QSC are also extremely helpful with circuit details, advice and help. Premature transformer failure. Very expensive replacement part at over £100 from UK distributors but thouroughly worth it once restored, these amps retail new for about £500 so repair is still very much a cost effective option. I have also found that the fans get a little noisy over time. Given that the cooling only occurs back to front it is vital that these are kept clean and in good condition. As used by the edge when U2 were a decent band. This would have been trying to rival the Mesa Boogie compactness is an extremely well made hybrid amp. 4x6L6 output stage and a slightly dissappointing single tube / solid state pre amp delivers a great clean sound and natural overdrive however the limitations of the two knob overdrive circuit are well documented elsewhere. This amp was suffering with some typical jack connnector and the FX switch problems resulting in occasional sounds and cutting in and out. 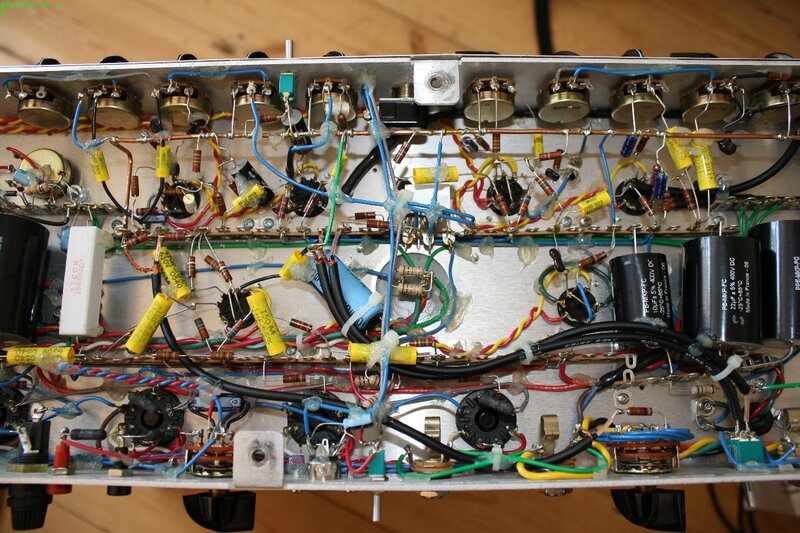 A little service is all that was required for this great work horse of an amp. Well I had the plea sure to service and modify one of these cool amps this week. A Carr Slant 6V. Absolutely fantastic build quality top to bottom on these amps – this just oozes quality everly little detail is just superb. Full point to point circuit, glued wi res, hand wound transformers this is the real deal. But what also stands out are the little things for example the screws holding the amp chassis in are made of the nicest metal I have ever seen. The cable connecting the speaker looks like a hifi cable rather than the usual ratty little piece of damp string. Great I would love one although it does cost the same price as a family saloon. Oh well! In terms of the mod it was just a simple case of removing a little treble cutting capacitor on the drive channel so if you want to know more please get in touch on that. The other thing to bear in mind is that the folks at Carr amps are incredibly helpful. 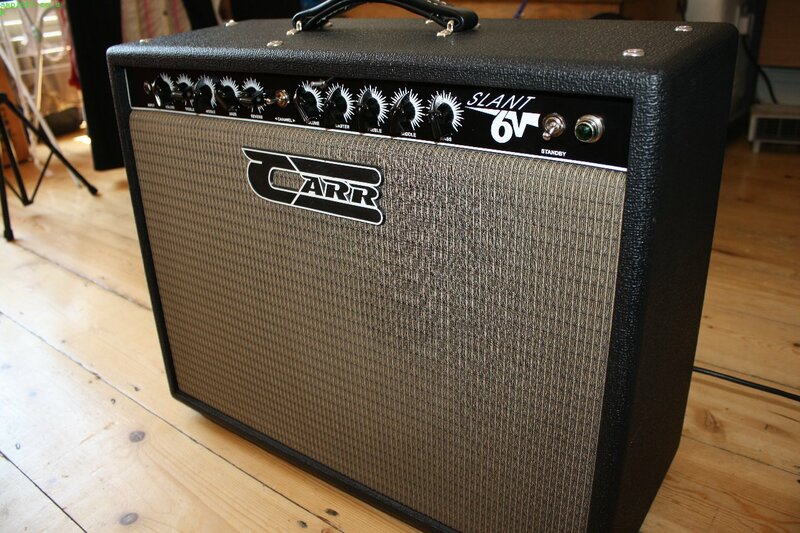 So if you have a Carr amp and need a repair or some servicing please give Amploft a shout. Over the last year I must have repaired half a dozen of these delightful solid state amps. Compact, loud and fully bobbly carpeted – nice. These amps are realy well made and rightly retain their value beyond the competition. Features are soldered connections throughout, nicely dressed wiring, serious pot earthing (see bottom of pic below) and quality capacitors. Jack plugs introducing hiss and crackles. Op amps failing usually results in a very non-musical distortion like a loud crackling. Fortunately repair is very straightforward with replacement components easily available and not at all expensive. Below you can see the socketed TL072 dual op-amps. Tony Ward the designer is still around mainly playing the guitar these days but also provides some replacement component modules such as an upgraded power ampplifier on his web site. Just google award session amplifiers to find out more. 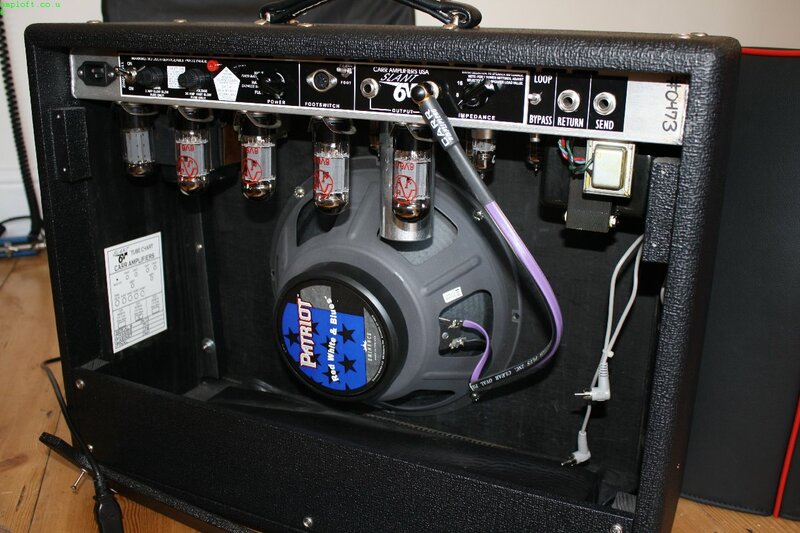 A common question I get emailed to me is: “Is it worth repairing my old guitar amp”. Well depends on how you approach life but for me it’s always a yes. Many amp faults can be categorised as “crude” problems like connectors, bad joints, noise pots. Or if they are “Hard” faults then usually a valve or associated component can be identified and replaced or it will be caused by a failed transistor, op-amp. Other intermittent problems are difficult to diagnose, and so do complex problems where a fault is multi-dimensional but mainly they can be resolved relatively quickly. If you approach the question economically and consider the cost of replacement vs the price of repair you will find that repair beats replacement in 90% of cases. Even on a little Park G25R practice amp that was not worth more than £20 the cost of repair was worth it. Although this amp was totally dead replacing the relatively easy to diagnose op-amp was worth doing it as the job was under an hour and the part cost just a couple of quid. Now going out and buying a new amp might be possible for £50 it would not be as good as this amp which actually sounds great for little practice amp. On a vintage fender another factor comes into play which is loss of value. As big business continues to chase increased profits, then all business will continue to strive for economy in parts, manufature labour etc. So in essence the newer the equipment the worse it’s going to be. Not always – but often in electronics. Many amp technicians rely on no-fix no fee approach and so from this point of view you never have much to lose – always mention an expense ceiling that you don’t want to exceed and then you can’t go wrong.